Treat everyone with politeness, even those who are rude to you…not because they are nice, but because you are nice. "Let us not forget that the cultivation of the earth is the most important labor of man. When tillage begins, the other arts will follow. The farmers, therefore, are the founders of our civilization." "Respect for ourselves guides our morals, respect for others guides our manners." "Good manners and kindness are always in fashion." "The meaning of good manners is 'enforcing the unenforceable"
Ready, Set... Time to Say Please and Thank You Again. A president yields much influence over the nation’s farms and agricultural assets. And the relationship between a president and the nation’s land has roots back to our first president. Deep roots, where the where the keeper of the land and the nation has been known to harvest the hay, plant the crops, milk the cows and manage the herd under-the-big-blue-sky. Maybe there is a gentleman farmer or two in the mix as well. America is about land, prosperity and amber fields of grain, so it is not surprising that our esteemed list of farmer presidents include a peanut farmer, an orchard farmer, a scholar farmer and a hard-working farmer who read by the firelight, and founded the first United States Department of Agriculture…in honor of and for the people who work the land. There are sixteen presidents who were farmers. And those same presidents lived the four tenants of manners and civility. George Washington did not chop down a cherry tree—he was more interested in managing his land. He oversaw his vast plantation at Mount Vernon in Virginia, where he was cutting edge for his time by implementing crop rotation and introducing grain farming to more tobacco-focused lands. Recent discoveries have revealed that Martha Washington was a true and equal partner to the first president. A few letters have recently surfaced. The letters have poor grammar and spelling, illustrative of the lack of formal education for girls and young women at the time. But Martha’s intelligence and perceptiveness readily come through in the letters. Martha was a physically attractive woman, an excellent manager, poised and self-possessed. George knew he could rely on her both to be partner in his business endeavors and manage the family, the estate, financial affairs and even political affairs. She was very much the public, activist First Lady. George Washington, too, loved being at Mount Vernon. He enjoyed farming and wrote that “it is honorable, it is amusing, and, with superior judgment, it is profitable.” He believed Mount Vernon was the best estate in America for farming. Later in his life, he took great pride and joy in being thought of as the first farmer of the land, along with his first farmer lady. John Adams’s farm in Quincy, Massachusetts, was called Peacefield. John and his wife, Abigail owned 40 acres of orchards and farmland, and passed the land down to the sixth president and their son, John Quincy Adams. John Adams grew up as the son of a farmer and was nicknamed “His Rotundity” because he was short and chubby and fond of formal titles. He and Thomas Jefferson were different in many ways, but they shared a passionate love for their country. It made them the best of friends and worst of enemies at different times during their political history together. On his extensive Monticello gardens, plus his additional 5,000 acres of nearby farmland, he experimented with 330 varieties of fruits and vegetables, including new and old world grapes, over 100 kinds of fruit trees, and then-exotic curiosities like sesame, chickpeas and kale. The legacy of Thomas Jefferson is that of founding father, farmer, architect, inventor, slaveholder, book collector, scholar, diplomat, and the third president of the United States. Jefferson’s intellectual development began in his earliest days in the Piedmont to an ever-expanding realm of influence in republican Virginia, the American Revolutionary government, the creation of the American nation, and the revolution in individual rights in America and the world. At the University of Virginia, serpentine walls were designed by Thomas Jefferson for the landscaping of the University of Virginia. The serpentine walls on the grounds of the University of Virginia, Charlottesville, reveals at least three of Thomas Jefferson’s strengths: his frugality as a builder, his interest in horticulture and his ingenuity. According to Jefferson, building a wall that curves uses twenty five percent fewer bricks than building a straight wall because a curved wall supports itself and can be only one brick thick instead of the two-brick thickness required to keep a straight wall standing. And, once built, a serpentine wall provides the gardener with locations that provide light or shade during particular times of day or seasons of the year, whichever might be best for a unique or delicate plant set out in that location. James Monroe’s farm at Oak Hill in Virginia has been a working farm since 1724, and is still a privately-owned residence and farm. Monroe returned to the farm in 1825 after two presidential terms. He spent his time writing his memoirs and doing casual farming. Before becoming president, Monroe spent many years in public service, both domestically and overseas and was the first president to have been a U.S. senator. Although he studied law under Thomas Jefferson, he was not considered as brilliant as some other leading members of the Revolutionary generation. But his contemporaries liked and admired him for his sensible judgment, his honest and his personal kindness. Like his fellow Founding Fathers and fellow Presidents John Adams and Thomas Jefferson, he died on July 4, the anniversary of the signing of the Declaration of Independence and the nation’s official birthday. 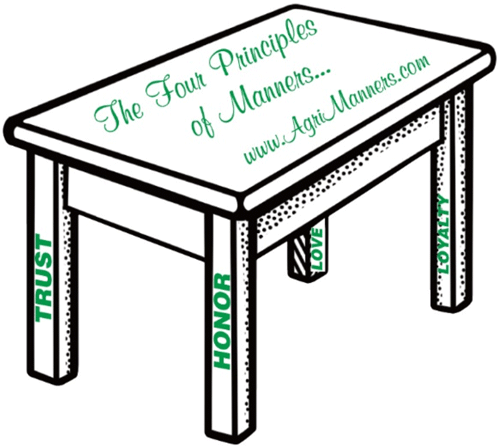 Coming in September: the next 5 farmer presidents and how they lived the four tenants of manners/civility. Remember: Share your goodness, far and wide, as much as you can, with as many people as you can, for as long as you can, with as much respect as you can. Ready, Set…Time to Say Please and Thank You again. R.S.V.P in a timely way! Thank you for your interest in Etiquette Iowa. We would be happy to provide you with more details on any of our etiquette programs, including class schedules and reservations. Please contact us with any questions. On behalf of the development network, Mid-Iowa Chapter, I would like to thank you for your AMAZING presentation…it was our pleasure having you. Everyone has been talking about the presentation. You are the talk of the town! Thank you. "Thank you for sharing your knowledge about etiquette with us..I heard many wonderful comments." "You were an incredible help..."